The Hispanic Association of Colleges and Universities’ 24th Annual National Capitol Forum on Hispanic Higher Education, convened approximately 190 higher education and student advocates in Washington, D.C., on April 1-2, 2019, to help promote the Association’s Legislative Agenda. Two free pre-conference sessions provided information about federal grant funding opportunities available for Hispanic-Serving Institutions (HSIs). Representatives from the U.S. Department of Agriculture, Department of Education, Department of Defense and the National Science Foundation were among the workshop presenters. HACU’s legislative proposal for the creation of a Part C under Title V of the Higher Education Act was among the priorities discussed at the Forum and during the visits to Capitol Hill. The proposal calls for the creation of a grant program under the U.S. Department of Education to support partnerships and collaboration between HSIs and Hispanic-Serving School Districts - the districts that educate the majority of Hispanic students. HACU is currently working with several Congressional offices to introduce this new bill to help improve educational attainment for Hispanic students leading up to college. Panelists also discussed the impact of the U.S. Department of Education’s HSI-STEM Program (Title III, Part F) and the National Science Foundation’s HSI Program on increasing Latinos in STEM careers. HACU and organizations representing other Minority-Serving Institutions have been working diligently with key members of Congress to extend the life of Title III, Part F of Higher Education Act (HSI STEM & Articulation Program), which is set to expire on Sept. 30, 2019. The possibility of advocating for a temporary three-year extension through an appropriations bill is an option being proposed. The two-day Forum offered sessions on HACU’s legislative priorities to help prepare participants for the state delegation visits to congressional offices on Capitol Hill. A student advocacy workshop was also offered. On the second day of the Forum, delegations from colleges and universities in 20 states and Puerto Rico visited Capitol Hill to advocate for funding for Hispanic-Serving Institutions. A total of 359 Capitol Hill meetings were held with representatives from Arizona, California, Colorado, Connecticut, Florida, Georgia, Idaho, Illinois, Indiana, Louisiana, Massachusetts, Nevada, New Jersey, New Mexico, New York, New Jersey, Oregon, Tennessee, Texas, Washington and Puerto Rico. The Forum concluded with a debriefing session and a Capitol Hill Reception. The Association encourages advocates to ask their representatives to join the Congressional HSI Caucus, which will be essential for advocating for federal resources for HSIs during the reauthorization of the Higher Education Act. A copy of HACU’s 2019 Legislative Agenda is available here. Special thanks to HACU 24th Capitol Forum sponsors Educational Testing Service (ETS) and The Bush School of Government & Public Service at Texas A&M University. 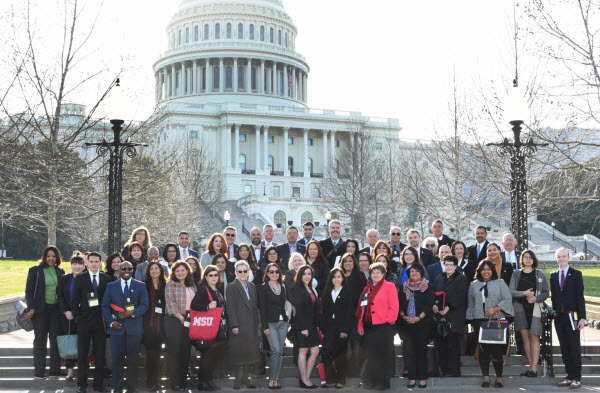 HACU will host its 25th Capitol Forum on April 21-22, 2020, at the Washington Court Hotel, in Washington, D.C.
Photo: 2019 Capitol Forum attendees.